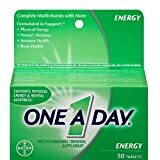 One A Day Energy is a multi-vitamin with added caffeine and B vitamins designed to promote alertness. 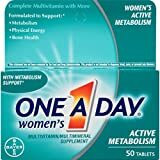 It contains 27 supplements in all including a wide array of vitamins and minerals. 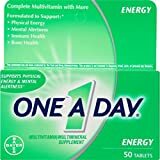 Consumers are directed to take just 1 One A Day Energy per day and should be aware of the caffeine amounts they are consuming from other sources. Calcium Carbonate, Potassium Chloride, Cellulose, Guarana Seed Powder, Caffeine, Ascorbic Acid, Magnesium Oxide, Dicalcium Phosphate, Niacinamide, Corn Starch, dl-Alpha-Tocopheryl Acetate, Ferrous Fumarate, Croscarmellose Sodium, Stearic Acid, Polyvinyl Alcohol, Zinc Oxide, Maltodextrin, Silicon Dioxide, Acacia, Magnesium Stearate, Ethylcellulose, D-Calcium Pantothenate, Crospovidone, Titanium Dioxide (color), Gelatin, Polyethylene Glycol, Talc, Manganese Sulfate, Pyridoxine Hydrochloride, Cupric Sulfate, Riboflavin, Thiamine Mononitrate, Glucose, Hypromellose, Castor Oil, Sodium Borate, FD&C Yellow #5 (tartrazine) Lake, Vitamin A Acetate, Beta-Carotene, Folic Acid, Chromium Chloride, Biotin, Potassium Iodide, FD&C Blue #1 Lake, Sodium Selenate, Sodium Molybdate, Phytonadione, Nickelous Sulfate, Sodium Metavanadate, Stannous Chloride, Tricalcium Phosphate, Cyanocobalamin, Cholecalciferol.